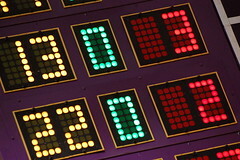 Coach David's Corner: The First Quarter is Over ... What's the Score? The First Quarter is Over ... What's the Score? The first quarter is over ... what's the score? I'm not talking about the NCAA - I'm talking about the first fiscal quarter of the year. What are your revenues like? Are your budget predictions and forecasts on the mark? Is it shaping up to be a good year? Zacks just released their "Top Three Best Performing ETFs Of the First Quarter." Corporations are lining up reporting schedules for releasing their first quarter numbers (check out Mercantile Bank Corporation , West Coast Bancorp, and PPG Industries). But if you really want to dive into facts and figures, check out this release that puts financials in context and offers correlations, indications and implications of those figures. Beyond reporting, Seeking Alpha took the data and made use of it to establish educated predictions and forecasting for the coming time period. The Globe and Mail recently released a great article discussing the value of data to businesses (large and small). Knowing what your numbers are is a first step; being able to translate that data into business practice, advertising strategies, and hard, cold profit is another. Are your financials up-to-date? What do those numbers mean to you, and how will you extrapolate the data you have to ascertain whether or not you are on track for this year? At ActionCOACH Lethbridge, we provide expertise and analysis to translate your numbers into strategic policies that will shift your business to a new level of productivity. Let us show you how to manipulate the figures on your reports to achieve better performance, greater efficiency, and overall improved business practice. Know the score - and leverage your resources to win the game. Coaching is not just for sports.